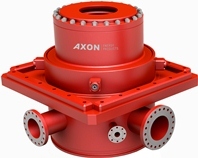 Ideal for containing and diverting fluids and gases away from the drilling rig during operations, the AXON 21-1/4” Type 70 Diverter System can seal on any pipe in the wellbore, as well as perform a Complete Shut-off (CSO). Hydraulically-actuated locking dogs are utilized to secure the diverter into the support housing. In addition, a running and test tool can be used to test the diverter when it is landed into the housing. Side outlets can be provided up to 20” nominal for adequately diverting the flow, as determined by rig operational requirements. Various bottom connections for interface to the upper flex joint are also available.